Congratulations to Hank Shaw, winner of the 2013 James Beard Foundation Award for Individual Food Blog. This was Shaw’s third nomination for his blog Hunter Angler Gardener Cook which chronicles his pursuit of honest food. 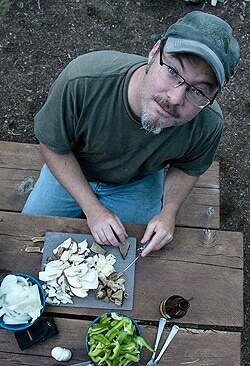 In addition to writing, Hank teaches food classes in the Sacramento area. His next appearance will be Friday May 10 at Whole Foods for Cajun 101. Author StickiePosted on May 3, 2013 Categories FoodLeave a comment on Hank Shaw wins! Scott Miller, leader of the bands Loud Family and Game Theory, died this week. While fame eluded him, Miller was influential and respected among musicians and critics. His passing is noted in an obituary in Spin Magazine. Miller was also a music writer, publishing Music: What Happened? in 2010. According to his website, Miller had reformed Game Theory and was planning a new album. He was 53 years old. N.B. Scott Miller, founder of 80s Sacramento record label Secret Center, is alive and well. Chi Cheng, bass player for Sacramento’s Grammy-winning Deftones, has passed away at age 42. Cheng was injured in a 2008 traffic accident and never recovered. A candlelight vigil will be held in Cesar Chavez Park on Sunday at 6:30pm. Author StickiePosted on January 9, 2013 Categories SportsLeave a comment on Farewell to the Kings?